Sight hounds were bred to hunt and course small animals frequently contributing to the family food supply. Unlike many other breeds that have lost much of the instinctive drive for which they were originally bred, most sight hounds still retain an active prey drive. This does not make them any less suitable as pets and companions, but it does mean that placement representatives and adopters need to be especially responsible in handling the dogs. We ignore the history and heritage of our greyhounds at the peril of other pets. I recently attended an outdoor event where there were over 200 leashed greyhounds and had the disturbing experience of seeing one greyhound attack an Italian greyhound. The look of terror in that little dog’s face is vivid in my mind, as the owner examined it, her own greyhound standing by, shaking like a leaf. The injured dog died later that day at an emergency animal hospital. How does something like this happen? In the blink of an eye. One day while taking a walk in the woods with my dogs, my leashed greyhound was suddenly shaking a brown furry animal in his mouth. There had been no pulling on the leash, and I didn’t see where the animal came from, not could I tell what it was. After a lot of screaming on my part he dropped the rabbit, its spine apparently broken. My Dalmatians looked at it and my other grey picked it up and shook it. I screamed some more and he dropped it. We walked home and I felt miserable. Both of my greyhounds are fine around puppies and small dogs, don’t seem interested in cats at the vets but the bunny attacker has always been distracted by the glass rabbit cages at some stores where we do demos. 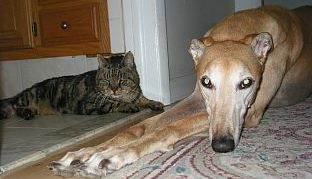 One little female greyhound who was adopted through our group had a very strong prey drive and the adopter was clearly told it could not be near cats or small animals. This sweet dog was then introduced to a parrot who did not survive the introduction. Several weeks later when being walked on lead this grey encountered a boy with his puppy running free. The adopter managed to disengage her dog’s jaws and the boy and puppy ran off. And then there was the greyhound being exercised off lead at a golf course who thought a young girl’s dog was its prey. The greyhound owner was shocked and paid for the little dog’s vet bills for wound care and antibiotics. Experiences like this are rare, fortunately, but cause great distress to the greyhound owner and more unhappiness for the owner of the injured or killed pet. If your adoption representative has told you that your dog is not cat-safe or is keen on small animals, please remember this and be extremely careful in public where encounters with other animals are possible. No matter how sweet your dog is to humans, steer clear of puppies, small dogs, cats and keep a tight leash. Certainly don’t let it run free. Many pet supply stores encourage people to bring their pets shopping and in these situations there is potential for close encounters. If you are doing an adoption demo please be particularly cautions as people often bring their little pets over to meet the dogs. If you are not vigilant and your dog does attack another animal, you risk permanent injury to yourself if you try to open the dogs jaws manually. As a Hand Therapist for 19 years I have treated many people with dog bites who have been left with significant functional impairments. We love all of our adopted greyhounds and some need to be watched very carefully so their instincts don’t prevail and cause great harm to small pets.